Stay at Bowen Terrace Accommodation, a 2018 TripAdvisor Certificate of Excellence awarded guest house and hostel where everything is at your doorstep. Free on-street parking right outside our front door, catch a bus across the road, or walk to City Centre/New Farm cafes, bars & cinemas. We have the right room for your budget, offering both private rooms in our upstairs guest house (street level), or dorm rooms downstairs in the house. Guest facilities include an outdoor pool & bbq, kitchen, tv lounge and laundry/clothes line on site. Shuttle bus airport transfers can be arranged by request through Con-x-ion by Ann or the duty manager at reception. 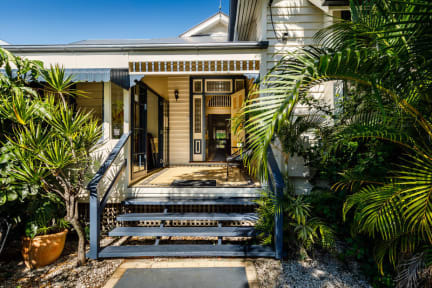 Stay in a clean, comfortable, classic Queenslander! 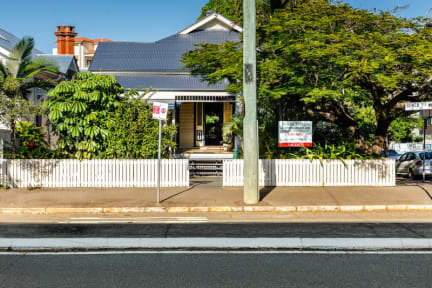 Your accommodation is based in a charming Queenslander house, purpose built as a guesthouse over two floors in the 1930's, featuring spacious rooms with original wooden floors and high ceilings. Within just 150m is New Farm Village, where you will find the popular Gerties Bar, The Brunswick Project Cafe, Continental Cafe, New Farm Cinemas, Taj Mahal Indian, Koya Japanese and much more.